At Ken Garff St. George Ford, we believe in the importance of strong designs. 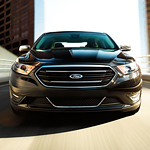 You can experience all that the Ford Taurus has to offer when you take it for a test drive. In the meantime, let us explain the design elements of this popular full-size sedan. Quality materials are found inside and out. The interior has a beautiful and comfortable design for you and your passengers. You can choose from premium cloth or leather seating. Plus, the technologies will be sure to add that extra sense of luxury when you’re driving around town. The exterior looks impressive even when you don’t have the pedal to the metal. The sophisticated look is refined with aerodynamic lines. There’s a bold grille in the front as well as signature LED lighting in the headlamps and taillights. Should you choose the Taurus SHO, you can look forward to even more premium elements.